Lightweight and quick drying. Textured contrast mesh side and shoulder panels with coverstitching. S..
Breathable and lightweight. Quick dry treated textured fabric. Loose fit. 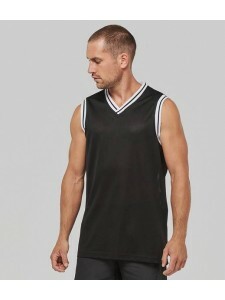 Contrast bound neck and ar..
Cool-Dry© fabric is moisture wicking and quick drying. Self fabric bound neck and armholes. Locker p..
Wicking fabric keeps you dry and comfortable. Birds eye knit. Self fabric bound neck and armholes. C..
Moisture wicking Isovent fabric. Anti-bacterial. Quick drying. Self fabric bound neck and armholes. .. Slim fit. Self fabric crew neck. Mesh panel under armholes. Flatlock stitching. Twin needle hem. Tea..
Textured fabric is moisture wicking allowing you to stay cool, dry and comfortable. Self fabric neck..
Gym fit. Neoteric™ textured fabric with inherent wickability. UPF 30+ UV protection. Self fabric bou..
Neoteric™ textured fabric with inherent wickability. UPF 30+ UV protection. Contrast side body panel..
Moisture wicking with quick dry performance. Self fabric bound neck and armholes. Printed back nec..
Moisture wicking smooth fabric with anti-microbial properties. Racer back style. Deep armholes. Side..
Neoteric™ textured fabric with inherent wickability. UPF 30+ UV protection. Self fabric bound neck a..